High powered motor, a very stable base and lack of any vibration. Fruits are highly nutritious and one of the best ways to have them is to extract the juice. The Breville BJE510XL squeezes out every last drop of juice without sacrificing any nutritional value thanks to its patented Nutri Disc system. This system manages to transfer juice from pulp to beaker without heating it up and hence keeps enzymes and nutrients uninitiated. Graced with a 900 Watt motor, it can operate at two speeds. At the 6500 RPM it is perfect for grazing through soft fruits while at the 12,500 RPM setting it manages to tear through tougher vegetables and fruits such as apples or beets. The best feature of the Breville BJE510XL is a tiny smart chip embedded in it that automatically adjusts power in accordance with the needs. Together with a wide feed chute of 3 inches, it leads to efficient juicing with very little preparation time required and less wastage. 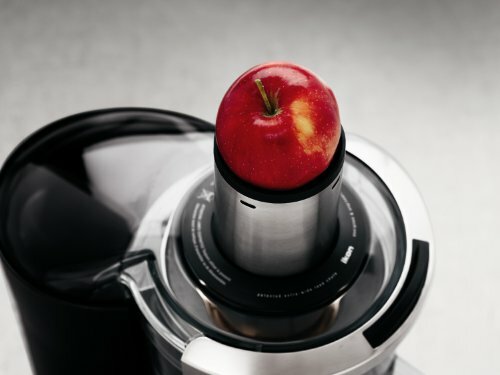 This Breville juicer saves time and effort. Straight up front, I believe this is the best centrifugal juicer in the market at present. 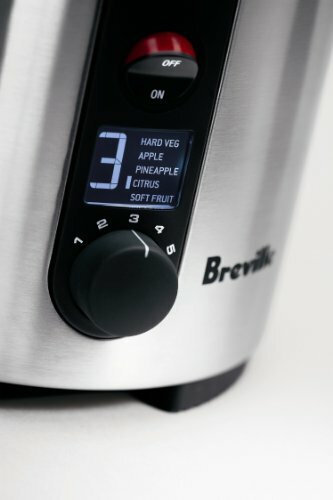 Compared to every other Breville model available, the Breville BJE510XL comes with so many useful features that it makes juicing healthy, fun and easy. A powerful 900 watt motor, plenty of speed options and the ability to grind through tougher veggies all give this juicer a lot of credibility. To start with, I found the vibrations to be constrained with this juicer, which is something you need if you plan on juicing berries and grapes. Lesser the vibration of the juicer motor, longer the pulp stays on the screen. So, at low speeds and with careful extraction you can actually manage the efficiency commonly seen in masticating juicers without even heating the juice up. In short, its not just efficient but also healthy. Then there is the 3 inch feed chute that makes it easy to drop in ingredients without even cutting them up. The cutting discs seem to hold well against constant use and when I say constant, I mean daily non-stop use. I am a fan of juice and purees so any juicer I get sees constant use three times a day for over months until they ultimately break down. So, when I say that its been three weeks and this juicer still manages to keep the efficiency intact, it means that the Breville BJE510XL is a dependable equipment. Just do not expect soft fruits and veggies to go through the juicer with complete extraction. The pulp will tend to be a little soggy but its not much. 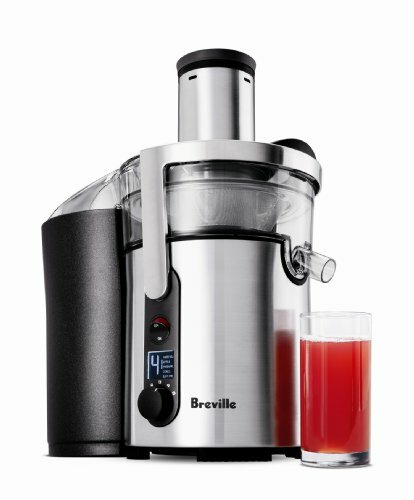 Detachable components, decent performance and loads of dependability makes the Breville BJE510XL a must have juicer. Not your average tabletop juicer, so don’t expect it to choke on dense veggies. The only real thing it won’t be able to squeeze the juice out of is wheat grass, which no centrifugal juicer can ever achieve. This juicer is mighty easy to use and handle. A 3 inch feed chute, larger sturdier filters, lack of vibration and a powerful motor all come together to make this juicer really easy to use. You can throw in any fruit or veggie and expect it to come out totally juiced. Clean up takes a little getting used to because of the parts this machine uses. 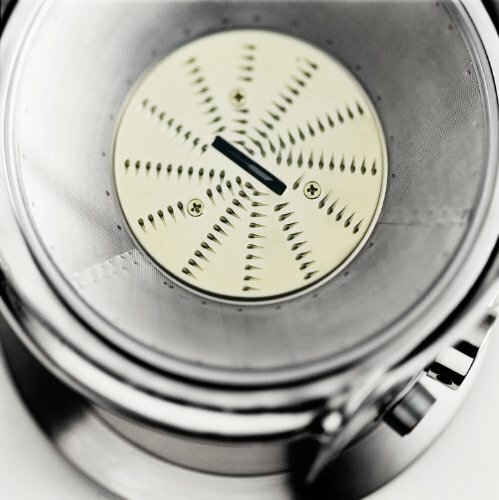 First you have to open it up, which again is a bit tricky with locks and latches in place. Then you have to individually clean each component removing every trace of pulp. It just takes much longer than normal but not something to worry about. Expect a bit of foaming, especially with pulpy of leafy ingredients and the taste profile is slightly altered because of its centrifugal action but overall, we found the quality to be better than packaged juices. The pulp still retains a bit of juice, more so with pulpy fruits but the yield is definitely high enough to justify its price tag. Don’t bother putting the used pulp back again as it only drips out a few extra milliliters at best. High powered motor, a very stable base and lack of any vibration make the Breville BJE510XL an ideal choice for the budget conscious yet power savvy person. It makes noise and if it did not we would have not understood its immense power. 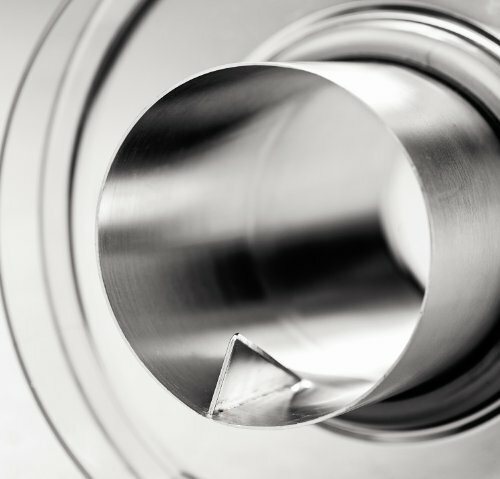 The only reason why we deducted one point is because for the noise it makes and the power it possesses, it could manage to squeeze out a bit more juice. 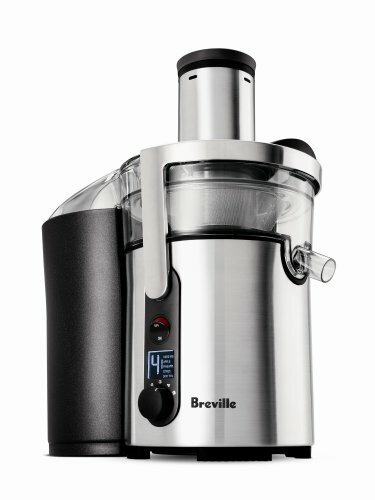 Like I said before, the Breville BJE510XL is possibly the best juicer I have tried out till now. Loads of power, lots of speed variations and plenty of efficiency, all make this juicer worth investing into. For folks who don’t like masticating juicers because of their low speeds and noisy operations, the Breville BJE510XL offers quick operation and a more than decent performance. Pros: Well priced, good features and a sturdy construction, this juicer is mighty easy to use and can tackle anything you can think off. Cons: Takes time to clean and juice contains slight foaming. Pulp extracted isn’t dry by any means. Weighs just 15 pounds and measures 16.7 inch by 15.5 inch by 10.25 inch. 5 speed operation, 900 Watt motor. Varied speeds between 6500 RPM to 12500 RPM. All parts are dishwasher safe including the 3 Inch feed chute. 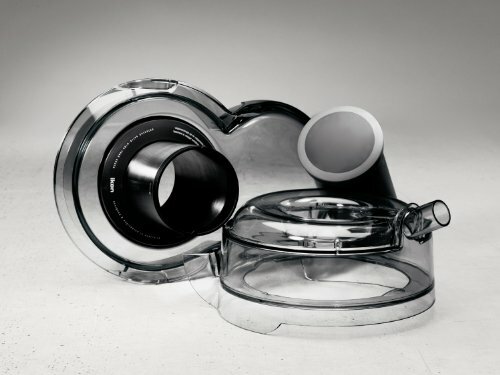 Comes with a cleaning brush, detachable spout and froth separator/juice jug.